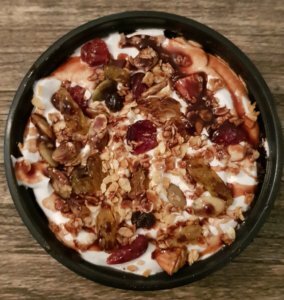 Our second Healthy Eating Review is of Nutrifit from Grow Fit. 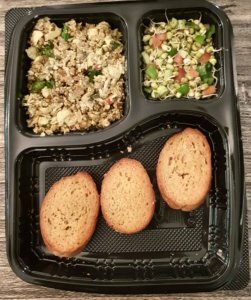 We were lucky enough to try over a week’s worth of breakfast, snacks, meals, and desserts of clean and healthy food from Nutrifit, who have just launched and are still in a pilot stage, but with big plans to develop into a similar set up (Meal Programs) as their other label, Grow Fit, which focuses more on Keto meals. Nutrifit offers us a range of healthy and international food aimed at a broader population. 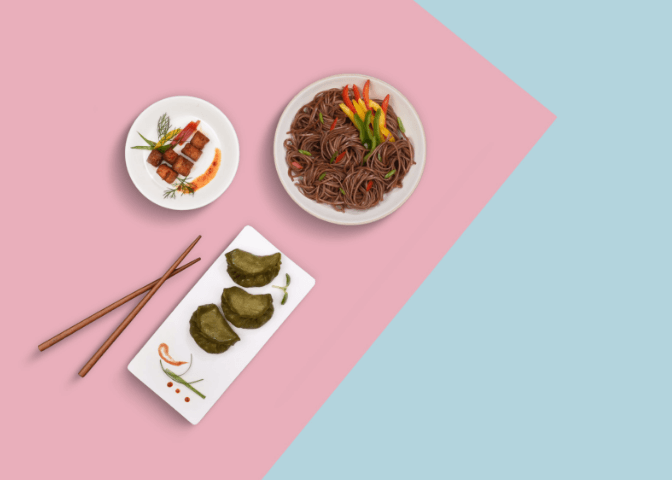 ABOUT THE COMPANY: Leading health tech company Grow Fit recently launched their new label, Nutrifit which aims to add a healthy twist to indulgences and favorite dishes such as Butter Chicken and Hakka Noodles. They use natural ingredients, avoid fats, and punch up the fiber and protein. They ensure no refined or artificial ingredients are used in the preparations, and emphasize whole grains and natural sweeteners. Millets are substituted for wheat and other grains. 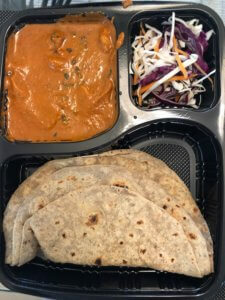 Their Guilt-Free Butter Chicken only has 9.4 grams of fat (compared to about 26-30 grams) and doesn’t use butter nor cream! The chicken is antibiotic free and Halal. All Nutrifit’s ingredients are sourced from reputed licensed vendors, registered with the FSSAI. 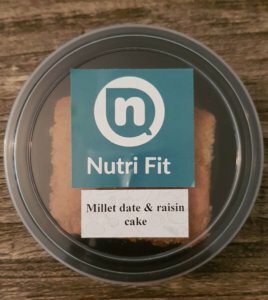 Nutrifit also has a bakery where they offer a range of healthy bread options. In the future, they will expand to different areas and offer full delivery just like their Grow Fit concept which has an easy to use app etc. The idlis were absolutely delicious, perfectly fluffy, and came with a yummy mix of roasted corn, carrots, green beans, cumin seeds and curry leaves. Even my picky eating toddler loved them. The chutney was tasty and mildly spicy. This was a tasty snack which can double as a small lunch, as the finely cut chicken, cucumber, carrot, baby corn, olives, and herbs felt like a salad on toasted bread. The sauce reminded me of Italian tomato sauce except that it was fairly spicy. This whole grain pasta is a great healthier option for pasta lovers, yet doesn’t taste like a diet version at all. The Arrabiatta sauce is on the spicer side and has a nice bite to it if you can enjoy spicy food. 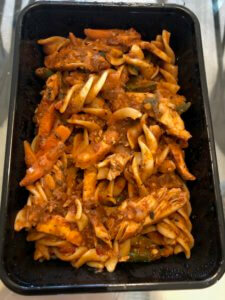 The dish feels fairly light for a pasta which surprised us, as the sauce wasn’t too heavy, yet feels filling. All in all though, it definitely didn’t taste like we were eating a diet pasta, which is great! As soon as you open the box, the flavourful smell hit us and we couldn’t wait to dig in. 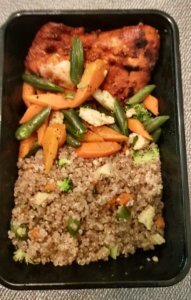 The quinoa was perfectly cooked, with finely cut baby corn, carrot, green beans and broccoli pieces that felt well balanced in my mouth. The larger cut roasted carrots, broccoli and green beans were full of flavour. The chicken was perfectly marinated and cooked with a hint of spice. The bread was the same type of baguette slices as we’ve tasted in other dishes. It came sprinkled with various herbs, however, I didn’t taste much of the garlic. 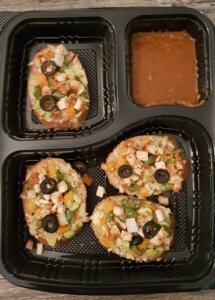 The sauce was the same as for the bruschetta, a sort of spicy version of an Italian tomato sauce. The first thing we noticed about this dish was that the rice was perfectly cooked! The dish tasted aromatic and flavorful with the perfect amount of spice. 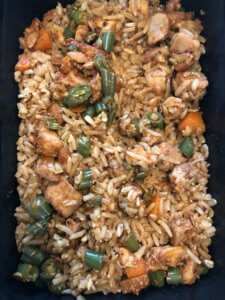 The brown rice was a good sub for white rice and a dish that kids are sure to enjoy as well! 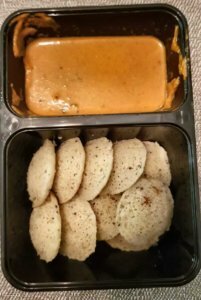 These idlis tasted simpler than the pan-tossed masala ones we had on day 1, but as perfectly fluffy as the others, and made for a nice, light breakfast option. I felt the goodness packed inside, as the idlies are made of rolled oats. The chutney was mildly spicy. 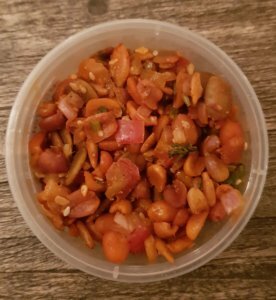 This is a healthy version of traditional chaat, made of roasted peanuts, sunflower and pumpkin seeds, tomato, onion, and coriander leaves. The spice level is about medium. This makes for a great high-fiber, low carb snack to tide you over until your next meal. This is another healthy take on a favorite Chinese dish – Hakka Noodles. The noodles are, however, not fried like they normally would be and are made of soba or buckwheat noodles. The dish is made with rice bran oil instead of the fattier vegetable oils. 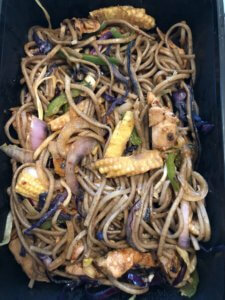 The dish was tasty and had a nice flavor, it would definitely be satisfying if you were in the mood for a stir-fried noodle dish- although a healthier choice! This vegetarian dessert is made with ragi/finger millet, milk and sweetened with honey. The dish was lovely, but on the sweeter side. This is perfect as a healthier substitute for people who crave something sweet after a meal. This was more of a western style breakfast and would be perfect for a meat and cheese lover. The omelette was cooked perfectly and had onion, tomato and coriander leaves. The whole grain bread was very good and reminded me of a healthy french toast even though it wasn’t sweet nor made with egg, but instead with the very healthy ragi/finger millet. We were excited to try their famous dish, which doesn’t contain added butter nor cream. We didn’t know what the secret ingredient was but were curious to see if it really did taste like a rich butter chicken. The dish came with three pieces of multi-grain roti, which we dipped in the sweet yet spicy sauce. The chicken was tender and delicious, and it really was a better alternative to one of our favorite Indian dishes. I really enjoyed this dessert: it wasn’t too sweet, the chocolate and cream were very light and fluffy, and the best part was that it tasted like a satisfying, indulgent dessert but is only 232 calories! The scrambled eggs were made with onion, tomato and coriander leaves, had a more Indian flavor, and were mildly spicy. The sprouts were yummy (if you like sprouts) and came with finely cut tomato, cucumber and green pepper. We thought our last meal would be pretty heavy considering it was a masala and rice but we were pleasantly surprised at how light it was overall. Compared to eating the real thing, we felt a lot less “stuffed” than we normally do, in a good way. The masala had a mild spice to it and the sauce was very good. 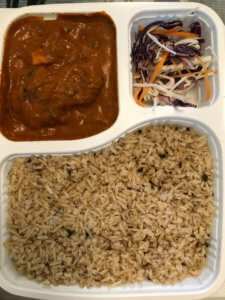 The brown rice was infused with jeera (cumin seeds) which gave it a really nice flavor. The portion size was also good, making it filling enough for a meal yet not overly so. This cake is made with dry fruits and millets. The cake had a great fluffy texture which was balanced by pieces of raisins and dates inside. This would make a lovely snack if you’re craving something sweet, light and healthy. This was the only sweet breakfast item I tried, and I can’t remember having tastier oats! 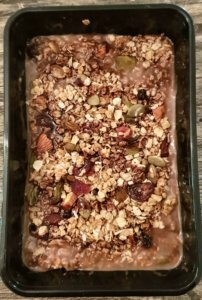 These are rolled oats mixed with broken wheat, in-house crushed granola, cocoa powder, honey, dried berries, pumpkin seeds, and almonds. This would be a great healthy substitute for those of us who like something sweet in the morning. 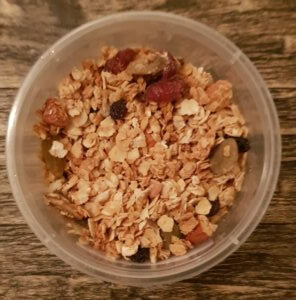 Yummy granola with dried fruits, nuts and seeds – I thought this would be great to eat on its own if you’re after a sweet and healthy snack or to sprinkle in yogurt/porridge/ etc. 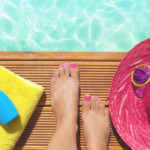 After trying out a large selection of breakfast, snack, lunch/dinner and desserts from Nutrifit, we can safely say that it doesn’t feel like you’re really eating diet food. The taste is not missing- and we could easily have eaten this for another few weeks without feeling deprived as is so often the case with other healthy eating programs. It’s amazing eating food that tastes good but also knowing that there are no refined or artificial ingredients used in the preparation. We love that we can see the nutritional info of each dish as well! 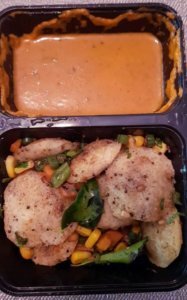 Nutrifit does exactly what it sets out to – “ We have given healthy twists to all-time favourites like Butter Chicken and Hakka noodles, without compromising on the taste and flavour.” The dishes are a nice mix of different cuisines although they do, of course, come back to Indian influences. A few of the meals may have been a tad too spicy for western palates, but perfect if you can handle it. 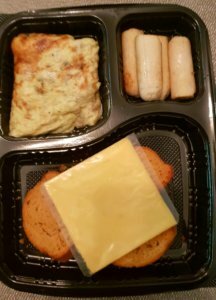 We think these meals would be best for someone trying to eat healthier but who doesn’t want to drastically diet. For example, this would be a better option if you want to eat clean but find yourself craving a Butter Chicken. We love the fact that pre-cooked healthy and tasty meals can be delivered straight to our doors every day of the week. Not only that, but the dishes taste yummy enough for kids (even picky eating toddlers) as well as even toddlers so it’s a nice option for the whole family. 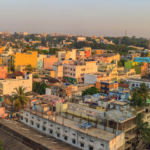 Alina Bouisseau is Ukrainian-American and has been living in Bangalore with her French husband and young son since November 2017. 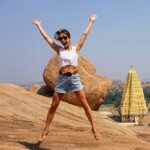 This is Alina's 2nd expat experience (she previously spent 6 years in London), and she's thoroughly enjoying Bangalore's perfect weather, learning about Indian culture, traveling around the country and Asia, and getting to know so many welcoming expats/locals and amazing entrepreneurs.